It's so sad and unfortunate that in this 21st century, women are still treated in such déplorable manner. On the17th of August 2018, about 2,000 Indigenous People of Biafra (IPOB) women embarked in a peaceful protest march demanding from Nigeria government and her security agents, the whereabouts of their son, Mazi Nnamdi Kanu and his parents, who went missing after Nigérian soldiers invaded their home in Afara Ukwu, Umuahia during ill-fated Operation Python Dance 2, on the 14th of September 2017. 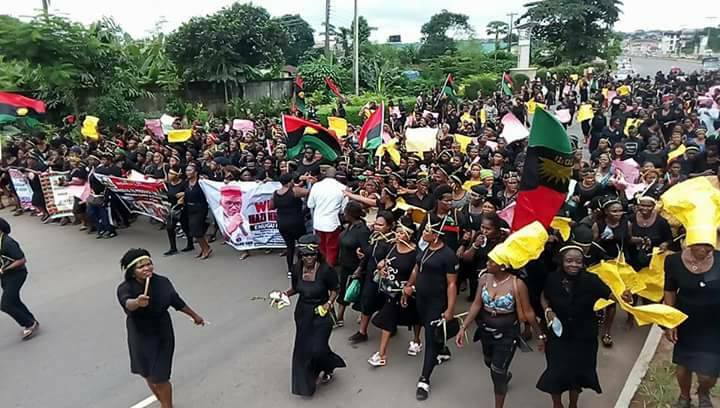 What started as peaceful protest suddenly turned awry, the women all dressed in black were seen on the streets of Owerri marching peacefully, singing and chanting to show their displeasure over the disappearance of their son, Nnamdi Kanu and his parents, HRM EZE and Lolo I. O. Kanu suddenly the aged women were rounded up by Nigeria police by the order of Imo State Commissioner of Police, Dasuki Galadanchi in collaboration with the State Governor, Rochas Okorocha. About 109 of them were kidnapped by police, humiliated, beaten, bruised, and denied medical attention, without access to family and friends. They were finally arraigned on Monday, August 20, 2018, after been illegally detained for more than 48 hours without trial and proper medication. They were denied bail by Owerri Magistrate court due to lack of jurisdiction to entertain the case and remanded in Owerri prisons, under inhuman and degrading condition. The government have vehemently denied these women their right ever since they were arrested, right now our mothers are facing psychological trauma, hunger and sickness. We demand that the United Nation, European Union, United States America, International Federation of Women Lawyers and every human right organisation to urgently speed up pressure on the Nigeria government to release these women. Stop the abuse of the rights of these women. Stop this Torture. Stop this humiliation. Stop this terrorism against unarmed women. Stop this tyranny upon Nigerians.